Do you have a herniated disc, multiple herniated discs, degenerative disc disease, facet syndrome? Is your doctor suggesting surgery, pain management, or physical therapy? Call for a free consultation about our spinal treatment programs. By significantly reducing internal disc pressure, DTS Triton spinal traction promotes retraction of the herniation back into the disc and promotes intake of fluids, oxygen and other substances necessary for healing the disc. This activity stimulates repair and inhibits leakage of materials from the nucleus of the disc. 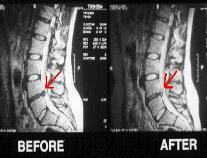 E MRI picture of disc herniation before and after treatment. G This is a picture of the computer screen. · In some cases surgery is necessary, more often it is not necessary. · Increased danger from anesthetic. · Increased danger from possible infections. · Prolonged recovery time after back surgery is generally 6-8 weeks. · Another 6-8 weeks of rehabilitation and physical therapy at 3 to 5 times per week. · Lower rate of successful results. · Without insurance patient’s cost for surgery is often over $25,000. · Even with insurance, patient’s share of surgical cost is often over $4,000 to $5,000. · Relief of acute or chronic (long term) low back pain and /or associated leg pain or numbness, generally within 4 weeks. · Successful in over 75% to 85% of patients. · Early return to work. · Non-invasive and extremely safe. · Cost effective treatment with a total cost usually less than $1500. Older type traction is a simple steady force that is put on the patient’s body with the intent of unloading the body's joints, muscles and other structures. For example, hanging upside-down is a common method to put the spine into traction. Rather than one's body weight putting stress on the spine, which is what happens when standing erect; the body weight is working to unload the spine. Various forms of traction have been around for over 1000 years; however, pain relief has been inconsistent and short-lived until now. In fact, several clinical studies have shown ordinary (old type, steady pull) traction to be an ineffective form of back and neck pain relief. The reason is unexpected, but pretty simple. Our bodies react to the steady pull of the traction on the spine by contracting, or squeezing, the muscles surrounding the spine. Rather than achieving the desired effect of unloading the spine, the pressure on the spine is actually increased, thus increasing intradiscal pressure. Thus this old type of traction does NOT allow the discs to re-hydrate and heal, which is what ultimately yields pain relief. 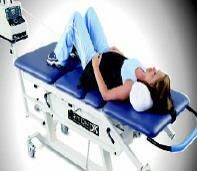 DTS Triton Spinal Traction, on the other hand, is a modern, computerized, updated form of traction. 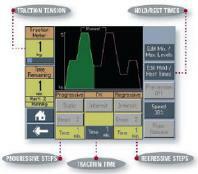 Computer technology is used to control variations in the unloading (traction pull) of the spine, effectively avoiding the body's muscle contraction response. Notice in the figure below that the traction tension is varied over time according to the graph. The doctor can control how many progressive tension steps are experienced by the patient before reaching the maximum tension. The doctor also has complete control over how long the tensions are held steady and how often they are repeated through the computerized system.